The Rural Festivities Unit within the Parliamentary Secretariat for Agriculture Fisheries and Animal Rights will be transforming the Għammieri Farm into a Christmas Village. 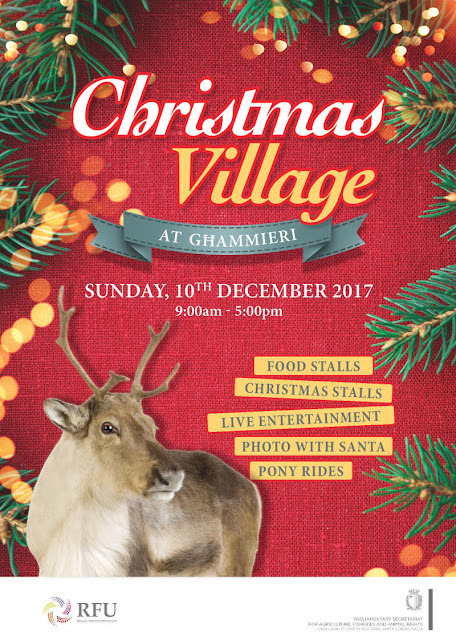 A Christmas market will be set up, offering different food stalls, Christmas delicacies such as Imbuljuta, Mulled Wine, christmas cakes, mince pies, honey, olive oil, chocolate items and much more. There will be also stalls selling various gifts, toys ,Christmas decorations, cribs and ponsiettas. One also can buy the recent cookery book published by the Community Chest Fund - ‘Tisjir mill-Qalb’ 2017. Santa Claus will also be present for children to take photos inside santa’s workshop! Other photos can also be taken with our farm friends such as the lama, deer and pony. Also children can have a close encounter with farm animals at a petting farm stall. An area will also be dedicated for children including story telling, a bouncing castle, train, face painting and glitter painting, magician and much more!! On the day we will be having also horse and donkey rides. The Hon. Clint Camilleri Parliamentary Secretary for Agriculture, Fisheries and Animal rights will be attending the event. The Rural Festivities Unit encourages everyone to attend this family fun day. The Għammieri Farm will open its doors to the public on Sunday 10th December from 9.00 -17.00. The event will include amongst other things a live stage entertainment throughout the day with the participation of local junior performers and also a roaming band. An animated mass celebration will follow at 10.00am with the participation of the Żurrieq choir and the traditional sermon of the child. Those attending can also visit the chapel to see the crib exhibition.